The Readykit system is easily adaptable for self-help housing projects. We erect the house onto a properly prepared raft foundation and roof it within two or at the most three days. 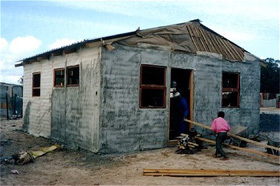 To finish it, the owner merely needs to apply the lime/cement plaster to the panels, paint, glaze, and the house is then ready for the doors to be hung, plumbing fittings installed, and electric loom for a formal reticulation to the plug and switch boxes already in place. The economic benefit is a sharp growth in home industry and lessened dependence upon jobs. As the concept spreads, so does productivity increase which helps support the value of the currency, reduce inflation, spread the training of building skills and the institutions that provide it, promote home ownership, and reduce crime. One of the hidden scourges that hit our economic productivity is sickness. Overcrowded tiny units that are built of single skin block are very difficult to insulate, and are inclined to sweat. In such conditions diseases such as TB thrive. 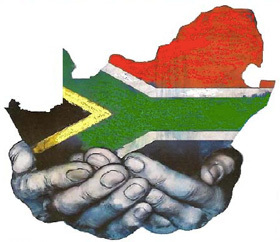 The Western Cape of South Africa suffers heavy winter rainfall and now has the highest incidence of TB in the world. And we wonder why. When the owner is directly involved in completing the house, there is a sense of self-worth, and pride in something important of value that he or she have created. Without this approach the big social danger is the growth of slums and all the social evils that go with them.